Self-Monitoring Blood Glucose Devices Market size is set to exceed USD 20 billion by 2024; according to a new research report by Global Market Insights. Rising prevalence of diabetes worldwide is the key factor that will drive the self-monitoring blood glucose devices market during the forecast period. According to the Diabetes Atlas of International Diabetes Federation, in 2017, around 425 million people aged between 20-79 years globally, suffered from diabetes and is estimated to reach over 629 million by 2045. Diabetes is leading cause of death in many middle and low-income countries. Lifestyle changes, increased consumption of alcohol and tobacco along with other environmental factors will boost number of people suffering from diabetes. Technological innovations in self-monitoring blood glucose devices leading to development of portable, user-friendly and high efficiency self-monitoring blood glucose devices will boost the market growth over the analysis period. For instance, in 2015, Dexcom launched Dexcom G4 Platinum, consisting of an in-built hypoglycemia safety alert, customizable alerts to monitor rise and fall above user-selected limits as well as water-resistant sensor with attached transmitter. It works with Dexcom share app that sends real-time glucose values to the cloud allowing caregivers to monitor blood glucose readings. Increasing adoption of such technologically advanced self-monitoring blood glucose devices for diabetes management will upsurge the self-monitoring blood glucose devices market size throughout the forecast period. However, high maintenance cost of advanced blood glucose devices and their accessories may restrain the self-monitoring blood glucose devices market growth over the forecast period. Moreover, stringent regulations for manufacturing such blood glucose monitoring devices will impede the industry growth to certain extent. Testing strips segment dominated the self-monitoring blood glucose devices market in 2017 with more than 79.5% revenue share and is estimated to witness robust growth during the analysis period. Testing strips are an essential component of blood glucose meters that are widely used in diabetes care and management. Geriatric population base, prone to diabetes, will further increase the demand for SMBG devices. Hospitals segment accounted for the highest revenue of USD 6.9 billion in 2017 and is estimated to witness lucrative CAGR of 4.6% during the forecast period. Increasing prevalence of diabetes across the world coupled with availability of technologically advanced blood glucose monitoring devices will serve to be high impact rendering factor in the segmental growth. Adoption of continuous glucose monitors for accurate, timely and efficient glucose measurement for ICU patients will stimulate the segmental growth in the coming years. 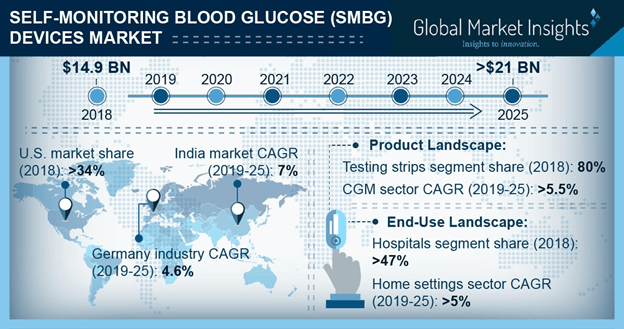 U.S. self-monitoring blood glucose devices market dominated global SMBG devices market with 34.2% revenue share in 2017 and is expected to show lucrative growth during the forecast period. Increasing prevalence of diabetes, availability of advanced healthcare infrastructure coupled with high healthcare expenditure are the key drivers that will accelerate industry growth over the coming years. Moreover, growing prevalence of obesity leading cause of diabetes will positively impact business growth. According to CDC, around 35.7% young adults aged between 20–39 years, 42.8% adults aged between 40-59 years, and 41.0% older population aged 60 and above suffered from obesity in 2016. Aforementioned factors will surge the U.S. self-monitoring blood glucose devices industry growth over the coming years. Germany self-monitoring blood glucose devices market accounted for USD 869.4 million in 2017 and is estimated to witness 4.5% CAGR growth over the analysis period. Growing geriatric population base in Germany, prone to diabetes will serve to be major positive impact rendering factor for market growth. According to the United Nations, the elderly population base aged 60 years and above was around 22.9 million in 2017 and is expected to reach 29.8 million by 2050. Rising disposable income, increasing awareness among people regarding diabetes care and management as well as developments in healthcare facilities will foster SMBG devices industry growth in the coming years. Some of the notable players operating in self-monitoring blood glucose devices market are Abbott Laboratories, All Medicus, Arkray, B. Braun Melsungen AG, Bayer Healthcare, Bionime Corporation, Dexcom, F. Hoffmann-La Roche, Johnson & Johnson, LifeScan, Medtronic, Nipro Diagnostics, Nova Biomedical, Sinocare and Trividia Health. Industry players primarily focus on strategic collaborations, acquisitions, mergers as well as innovative product launch to strengthen product portfolio and capture high revenue share. For instance, in August 2016, F. Hoffman-La Roche launched Accu-Chek Active blood glucose meter, to enable simple and accurate testing as well as ensure safe and reliable test results.